Russian Visa Invitation | Get One Today Online! Need a Russian Visa invitation? Here you can get one easily through the online form below. 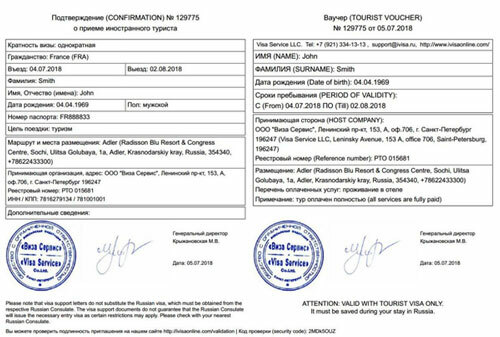 For your information, this is often called "visa support" or "invitation letter", and must be issued by the party inviting you to Russia, whether a tour company, employing company, educational institution, relative, or a friend. There are several type of visa invitation as you see below. Tourist Visa Invitation (if the purpose of your trip to Russia is for tourism or leisure, and you stay no longer than 30 days). This invitation is issued by a Russian tour company which is properly registered with the Ministry of Foreign Affairs and possesses a valid ‘tour reference’ number. Business Visa Invitation (if the purpose of your trip to Russia is for official or private business, and you stay for a maximum of 30, 90 or 365 days). This invitation is issued by the local department of the Passport and Visa Service (PVU) of the Russian Ministry of Internal Affairs (for paper invitations), or the Consular Department of the Ministry of Foreign Affairs (for telexes). Please note that your sponsor must be registered or deal with them to get this invitation! Private Visa Invitation (if you travel to Russia for visiting friends or family, and your stay lasts no longer than 3 months). This invitation is issued by the local department of the Passport and Visa Service (PVU) of the Russian Ministry of Internal Affairs or OVIR. You should wait 4–6 weeks for approval and obtain the original invitation to apply for a visa at the Russian embassy/consulate. Student Visa Invitation (if you come to Russia for study purposes, and you want to stay from 3 to 6 months, or a maximum of one year). This type of invitation is issued by the ‘foreign department’ of the university/school to which you've applied. Among all of these types of visa invitations, the easiest and quickest to get is the tourist one, while for the others it will take you about a month to get through the process, plus it will require lots of paperwork. Also, in some cases, it might be necessary for you to bring original documents to the consulate. I think there is no need to say that a cool head is really needed, if you do things on your own! Please, don't make the mistake of thinking that with just an invitation letter you'll enter Russia, because it's not like that. The visa support document (aka Russian visa invitation) is just an official document required to complete the visa application process regardless of where you apply. If you try to enter Russia with the visa support documents alone you will either be refused entry, or if you have arrived by air, you will be deported. Now the question is what type of Russian visa invitation do you need? Ready to apply? If so, stretch your fingers and fill out the online form below in all its form, and wait for our reply. To order a tourist invitation, just complete the online form above and wait. We partner with a trustworthy and registered local tourist agency that has been in business for more than twenty years ensuring efficient and reliable service to their customers. Once you've submitted your request, we will review all the information you sent and submit them to the agency, which will start the process of the invitation. Then, when your visa invitation document is ready, you'll receive an email from us. I NEED MORE THAN ONE INVITATION. HOW DO I DO THAT? If you're a group of travelers, let's say four people, then each traveler needs to submit their own application. The application form above is for one applicant, so each applicant needs to complete the form or have it completed on their behalf. The processing time is how long it will take us to prepare your support documents and send them to you. Usually 24 hrs, or maximum 48 hrs. If your exact travel dates are not yet settled, it is always a good idea to obtain a tourist invitation for a longer period than you actually plan to stay in Russia. Then you can get a visa for the same period and travel between the dates with no problem. You cannot enter earlier or overstay your visa but you always can enter the country later and/or leave it earlier than originally planned. WHEN CAN I EXPECT MY RUSSIAN VISA INVITATION AND HOW WILL IT BE SENT? If the application is submitted correctly can be processed immediately by email, so your invitation will be issued within the requested time frame. CAN YOU SEND THE INVITATION TO THE CONSULATE OR EMBASSY? HOW TO READ MY RUSSIAN VISA INVITATION? A tourist invitation comprises two documents: a confirmation and a voucher. We place the documents on the same sheet of paper for convenience. Hence two signatures and seals. The confirmation is on the top of the document, the voucher is below. Full name and reference number of the invitation issuer are indicated in Latin characters on the top of your voucher. I HAVE RECEIVED MY RUSSIAN VISA INVITATION. WHAT NEXT? These are all the documents you need to apply for a Russian visa. I AM IN RUSSIA. HOW DO I REGISTER MY RUSSIAN VISA? A foreign citizen must register with the local migration authorities within 7 business days upon arrival. Then a visa has to be re-registered in each city where you stay more than 7 business days. The registration must be completed by the receiving entity. Please note that the receiving entity is not necessarily the same as the inviting organization or hotel entered in the person's invitation and visa but a company, hotel or person a foreigner is actually visiting in Russia. If you do stay at a hotel, the registration is fully taken care of by the hotel reception. If you stay at a private apartment, your visa is to be registered by your landlord. However, it may sometimes happen that your hotel cannot provide you with visa support or may be unwilling to register you. In that case, you need to ask someone else, for example, us, but this must be done before you leave Russia. DO I NEED A RUSSIAN VISA INVITATION FOR TRANSIT VISA? No invitation required for a transit visa. Just show your travel tickets and visa for your country of destination. Keep in mind that we only supply the official invitation and voucher, two documents required by Russian law. Also, according to which country you come from, the support visa process may change or requires additional information or documents. From Russian Visa Invitation return to Russian Visa, or go back to the Homepage.